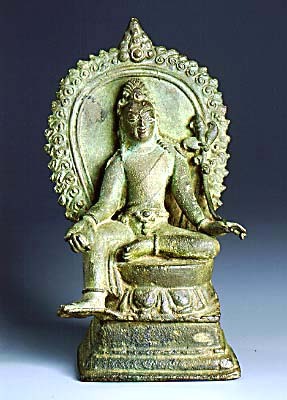 This is one of a group of objects representing some of the finest and earliest bronze sculptures in the Patan Museum. All depict bodhisattvas, enlightened beings, and originate in various countries on the periphery of Nepal. Some come from Bihar in northeastern India and from Bengal, now part of Bangladesh. They were made around the 11th or 12th century toward the end of the Pala period whose rulers were fervent supporters of Buddhism. All the images in this group were probably carried into Nepal by Buddhist pilgrims in bygone days. Such images, especially those from the Pala domain, were very influential in shaping the Nepalese artists' vision of divine imagery.